New Hampshire is home to manufacturing technology that isn’t being produced anywhere else in the world, which is beyond the state’s expertise in advanced textiles and composites. 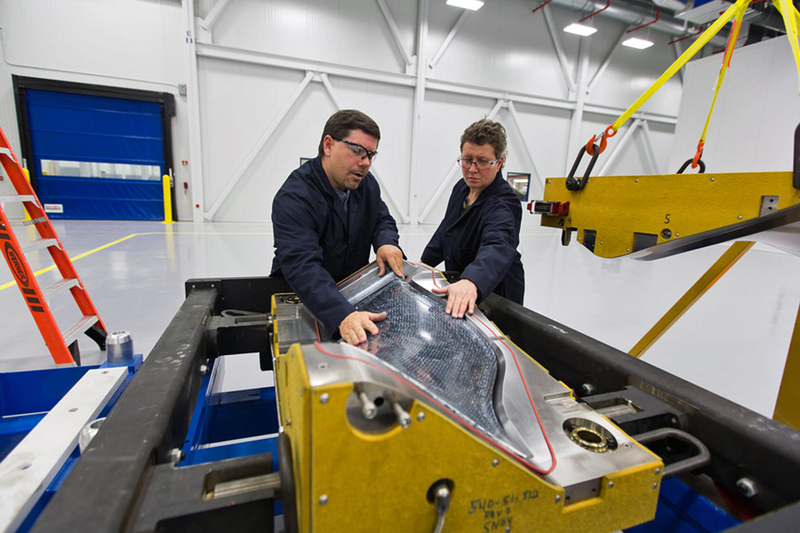 3-D woven composite parts for aircraft engines are being produced by a joint venture between Albany Engineered Composites Inc. and Safran Aerospace Composites Inc. in Rochester. 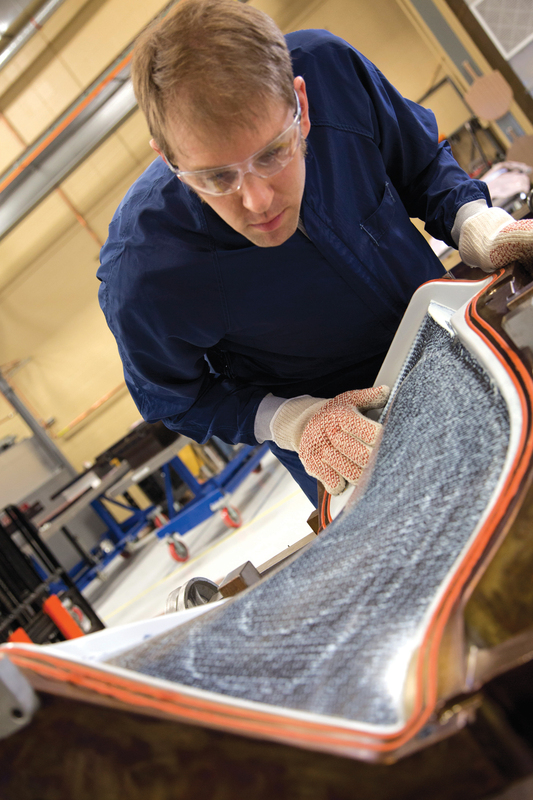 The Albany-Safran partnership develops materials used for fan blades and fan casings in the LEAP engine, and the landing gear brace for the 787. The materials reduce the weight of the parts resulting in more fuel efficient airplanes. At the state level, the advanced manufacturing sector is embraced by economic development officials and community leaders. Officials are putting together an updated strategic plan. Seven areas have been identified, including the advanced textile and composite space. “In addition to what is going in Rochester with the Albany-Safran project, we have many companies in the advanced textile space,” says Carmen Lorentz, director, New Hampshire Division of Economic Development. “When you look at the numbers in New Hampshire, the concentration is quite high compared to the country and it is growing; nationwide the numbers are going down,” she says. Lorentz says economic developers are also collaborating with education partners and industry to create more apprenticeship programs. To that end, the community college system has submitted an apprenticeship grant application to the U.S. Department of Labor. In Somersworth, “we are working with the high schools and the career technical center, setting up internships between businesses and students within various industries, which has been successful for both students and businesses,” says Christine Soutter, economic development manager, city of Somersworth. Somersworth is located between the University of New Hampshire and the new advanced training and academic center, a branch of Great Bay Community College (the college’s flagship is in Portsmouth). “There are interesting things in general in terms of aligning our state’s education system so that it meets the needs of industry much more efficiently,” Lorentz says. For example, the community college system and university system offer stackable degrees and career pathways. They are also aligning with the primary and secondary education system to build the state’s talent pipeline. In 2013, the Tax Foundation found New Hampshire had the eighth-best business tax climate. Consider there are no sales, use, inventory, capital gains, estate, Internet, or professional service taxes. New Hampshire has been rated by various organizations as the Most Livable State in the United States for the last five consecutive years, and the second Healthiest State and Safest State in the United States. New Hampshire offers three interstate highways — 93, 95 and 89 —providing easy access to major markets including Boston, New York and Montreal. Manufacturing is New Hampshire’s third-largest industry, representing 12 percent of private sector employment and paying wages that are 25 percent higher than average, according to the New Hampshire Economic Review 2014. The manufacturing sector includes activities in life sciences manufacturing and research; electronics for new medical technologies; and advanced materials and metals companies, many supporting the aerospace and defense sectors, Lorentz notes. There are more than 300 aerospace and defense companies in New Hampshire. Rochester is home to one of the fastest growing manufacturing companies in the state, Phase 2 Medical Manufacturing Inc. Another company, Laars Heating Systems Co., moved its headquarters and R&D to New Hampshire from California. The company manufactures energy efficient residential and commercial boilers. “One thing we find is when a company does R&D here they grow rapidly,” Pollard says. For example, the R&D facility for Lydall Inc., which makes filtration papers for blood projects and other medical applications, is located in Rochester. Lydall recently acquired a global company, and will add five locations to its existing five U.S. locations. Soutter says Somersworth is home to a diverse industry base, including advanced manufacturing, services and retail. She says Continental ContiTech, which makes the ecoboost hoses used in automobiles, is running three shifts. “A lot of our other businesses are steady — not off the charts — but they are healthy,” Soutter says. At a statewide level, additional industry clusters of strength include business and financial services, tourism, and IT and telecommunications. In Rochester, a training facility established a couple of years ago has doubled in size to more than 30,000 square feet, with the capacity to train up to 100 people. The training center is associated with Great Bay Community College, which covers the entire Seacoast area, Pollard says. She says the training center offers courses in composites and other topics. On a statewide level, in 2011, the Community College System of New Hampshire was awarded a $20 million U.S. Department of Labor grant to modernize the advanced manufacturing programs at all of its campuses statewide. Lorentz says the state has revamped the advanced manufacturing programs, and new facilities are under construction. There are seven community college campuses located in the state. “We are a small state and we have many small to medium-sized manufacturers, manufacturing a range of component parts for the aerospace and medical industry,” Lorentz says. In New Hampshire, economic development officials are used to working together to solve problems and pull resources together to address companies’ needs. “This is the type of thing we do every day, particularly to support workforce needs,” Lorentz says. She cites the example of bringing several companies together for instruction in fabrication and forming. GE Aviation in Hooksett required the training, as did smaller manufacturers. Manchester Community College developed a 10-week certificate program to support the companies’ skills training needs. 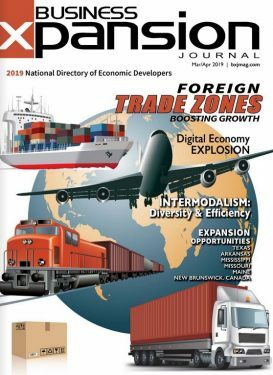 Other business advantages in New Hampshire include the rebuilding of Interstate 93, which is the largest infrastructure project the state has undertaken. A 20-mile stretch of road between exits 1 and 5 is undergoing major infrastructure enhancements. At the Manchester-Boston Regional Airport, a new ramp will provide direct highway access to the airport. As a result of the project, the area has seen the establishment of more than 1 million square feet of logistics and light manufacturing space, Lorentz notes. The additions will be important to Albany and Safran suppliers, who have been encouraged to site within a 20-mile radius of the partnership’s plant in Rochester. That radius includes the community of Somersworth, which has sites ready to go that are close to the Albany-Safran operation. “We have people living here who work a town over and people living a town over and working here. “What is good for our neighbors is good for us,” Soutter says. Pollard says the second newest industrial park in Rochester has existing spaces available, which would support multi-tenants. Companies will find that the real estate is supported by six revamped highway exits on the Spalding Turnpike/Route 16.
Business executives will also find Rochester offers a mix of housing options. In April, the city had $5 million in new housing starts, the best April in 10 years, Pollard adds. Soutter says quality housing is being constructed in Somersworth, and incentives are available to support the redevelopment of downtown housing options. This includes the 79E, which freezes the assessed value of the building pre-renovation for five years to seven years. “Developers can combine that tax incentive with a multimillion dollar downtown infrastructure project we are just completing, which includes water and sewer improvements, streetscape enhancements, safety enhancements, and a new bridge,” Soutter says. Back in Rochester, a new shopping center is under construction. The 350,000-square-foot development will feature open spaces to support events such as a farmers market and concerts. The city contributed $5 million in infrastructure support to the project. Hike the Flume Gorge in Lincoln to view amazing geological formations created by glacial erosion. Walls of granite rise 70 feet to 90 feet. New Hampshire offers a true four season experience, with mountains, beaches, beautiful lakes, great hikes, and fall foliage that attracts visitors from thousands of miles away. Source: stayworkplay.org. The Rochester Fairgrounds are playing host to new entertainment events, one of which is the Phantom Gourmet BBQ and Music Festival, formerly held in Boston. Five other events will take place this summer, and events are being planned for the fall. Living in New Hampshire puts residents within an hour of mountains or the beach. The state ranks near the top for standard of living, and child and family well-being. The state’s communities have been reinvesting in their assets, for example, in Portsmouth, historic preservation and high quality reuse of older buildings is taking hold. Additionally, in the last 10 years the population of Meredith has increased due to the quality of life found in this resort community. In the capital city, Concord, a major main street reconstruction project includes defined bike lanes, more pedestrian-friendly areas, and traffic calming components.